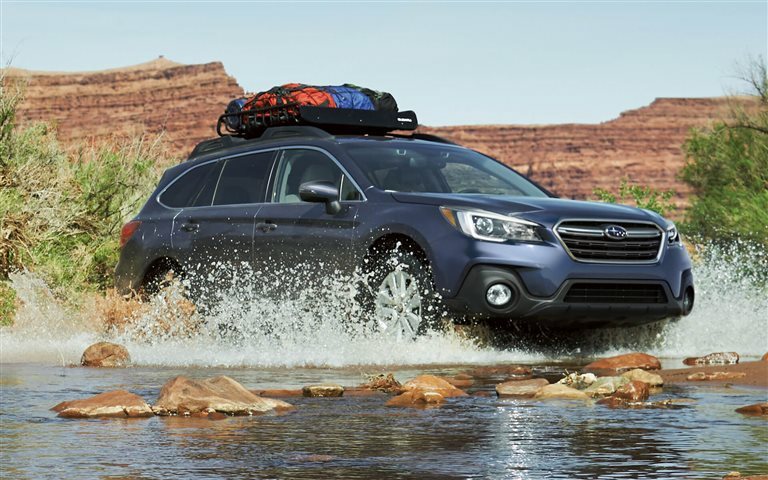 With six models to choose from, the 2018 Subaru Outback offers up a wide variety of options, inside and out. The Outback is way more than a wagon that is an attractive alternative to larger SUVs. It has more cargo space than some of it’s larger competitors, yet still achieves a 24-mpg overall rating and a smaller price tag. From the base model 2.5i to the very well-equipped 3.6R Touring, there is an Outback that can suit just about anyone’s driving and lifestyle requirements. Some nice additions to the 2018 version are Apple Car Play and Android Auto, both designed to interface with your favorite music provider. This is standard on all models. The technology does not end there. The 8” touch screen controls navigation, audio functions, and your favorite apps. Most models feature a 12 speaker Harman Kardon premium sound system with 576 watts. Durable SUBARU BOXER engines combine with a Lineartronic® CVT transmission to deliver up to a fuel-efficient 32 MPG highway. The Outback earned the IIHS Top Safety Pick Award with good performance in crash testing and a superior rated front crash prevention system. The optional EyeSight system includes forward collision warning, autonomous braking and throttle control, and lane-sway and the lane-departure warning and assist. Models equipped with EyeSight also get blind-spot monitoring and rear cross-traffic warning, welcomed features that are now standard equipment on the Limited and Touring models. We invite you to the Olympia Auto Mall and Hanson Motors Subaru and check out all the 2018 Subaru Outback models. You will not find a better vehicle that has 34 cubic feet of storage, all wheel drive, tons of safety and performance options, and a very high customer satisfaction rating. Come in and take a test drive soon. We look forward to seeing you.